Fertile, moisture-retentive but well-drained soil. Sunny spot with excellent air circulation. You will need two trees for good fruit set with sweet cherries. Standard tart cherries are often self fertile, and make nice landscape trees. Cherries benefit from a mulch of well-rotted organic matter and a feed with a balanced organic fertilizer in spring. Marigold, Garlic, Onion, Onions, Tansy and Nasturtium. Corridors within the orchard that are planted with clovers and other legumes contribute to soil fertility and attract pollinators. Prepare a large hole by breaking up the soil and adding plenty of well-rotted organic matter. A wide hole is better than a very deep one. Mulch after planting, and encircle the trunk with a wire cage or protective pipe to protect the young tree from animal and insect pests. Young cherry trees are at high risk for damage from insects that bore into the main trunk. 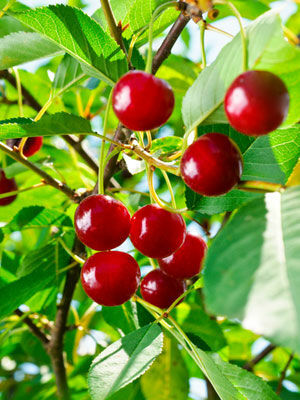 Many sweet cherries need to be grown with at least one other flowering at a similar time for pollination, but many tart cherries are self-fertile. Prune in late winter to shape trees and removed damaged branches. Healthy cherry trees will bear for twenty years or more. Pick cherries carefully so as not to damage the delicate fruit. Use netting to prevent bird damage. In humid climates, cherries often develop problems with fungal diseases such as brown rot. However, because cherries ripen early, they have fewer disease problems compared to many other tree fruits. If there are holes in the trunk which leak a gummy substance or sawdust-like frass, the culprit is probably a borer or beetle – to kill this pest, poke a needle into the hole. Tent caterpillars build gauzy nests in early spring, and devour leaves. Control by swirling a broom head in the nest, then use a stick to scrape the tent off and stomp on it.